Luca Bruno/AP/Press Association Images. All rights reserved.At the beginning of the summer of 2016 I participated in a sit-in against the ongoing siege of the Syrian city of Darayya in the Hague. The sit-in was organized by Het Syrische Comitè (Lagnalida ҅am al-thawra al-suriyya fi Holanda), a non-profit organization based in the Netherlands that supports the Syrian opposition against the regime of Bashar Al-Assad. As I was walking around Het Plein, where the sit-in was staged, I couldn't help but notice that the majority of the banners had 'the martyrs' written on them. Most were portraying scenes of violence perpetrated toward the inhabitants of Darayya. I turned to a man carrying one of the banners to ask him if he knew the name of the artist who had painted them. After pointing to the artist, he asked me where I was from. "Italy," I replied. "Ah, you have Regeni," he commented, smiling in dismay, then added, "We have thousands of Regeni in Syria." Five months have passed since the body of the doctoral student Giulio Regeni, bearing the signs of brutal torture, was found on the Cairo-Alexandria highway in Egypt. A huge amount of texts, artifacts, campaigns and conferences have surfaced since. Some are demanding an end to arbitrary detentions and disappearances of Egyptian journalists, activists and students by the Ministry of Interior. Others are pushing Italian and European institutions to investigate - with human rights campaigns insisting that 'truth' be sought and those responsible held accountable. What has remained under-examined, however, and was brought to my attention on the occasion of the sit-in, is that Giulio Regeni has been incorporated, as a symbol, into the narratives of Syrian and Egyptian activists in both Egypt and Europe. Numerous European leftists had been unable to see beyond the Cold War mindset and recognize the genuine character of the mobilization in the MENA region. By Cold War mind set, I mean an analytical approach that reduces an a priori social conflict to a question of proxy wars between the US and Russia. This was evident from the very beginning of 2011 when many Marxist European leftists dismissed the protests taking place in Syria as a "foreign conspiracy" to de-stabilize the region and thus fuel the war machine of capital. Many of my Italian comrades had insisted on granting their unconditional support to Bashar Al-Assad's Ba'ath party, which they saw as the herald of anti-imperialist, anti-Zionist politics in the region. Arab sentiment of revanchism toward Europe also created limitations. Over the past two years, it was not uncommon to hear Egyptian and Syrian comrades and colleagues in both the Middle East and Europe suspiciously looking at foreigners, irrespective of their political background, for their alleged compliance with the colonial designs of the "west". The incorporation of Giulio Regeni - a European - into these disparate narratives allowed for the re-emergence of a latent form of cosmopolitanism, which is not new in the dissident political praxis of Italy, Egypt and Syria. In the case of Egypt, the narrative of Giulio Regeni vis-à-vis Arab revolution presents an interesting case study of the complication of any clear-cut imaginaries of belonging - related to soil and ethnicity. In his 1932 prison notebook, Antonio Gramsci defines the character of Italian intellectuals as "migrant," "personal," "fragmented." This character, Gramsci goes on, does not enrich the national culture; it is both cause and effect of the political fragmentation of Italy from the fall of the Roman empire until the year of independence in 1870. The Italian bourgeoisie that emerged during the communal period were not strong enough to create a class of organic intellectuals that could produce a national cultural hegemony. In contrast, ‘strong’ absolute states such as Spain or France succeeded in this, and also absorbed Italian intellectuals into their structure. Although Gramsci’s writing does not address anti-fascist resistance, whereby intellectuals indeed played a role in cementing a post-war state imaginary, Italian scholars’ presence in Egypt in the last four years ought to be understood in continuity with the historical memory – that is, marked by a sense of exclusion of the intellectuals from the national context. It has been argued that the participation of Italians within Egypt’s cultural life over the last four years has been motivated by either escapism from an ideologically bankrupt climate in Europe, or by a European Marxist leftist tradition that “hunts revolutions” wherever they are. However, the history of the Italian-speaking anarchist movement in Egypt allows us to be more specific about the cosmopolitan investment of Italian intellectuals and activists in Egypt and, through the memory of that experience, the question of present imaginaries. European presence in Egypt dramatically increased in the nineteenth century. It was not only the process of modernization enacted by Mohammed Ali – with its need for a European labor force – that brought more Italian emigrants. Egypt also became the destination for political exiles from the Paris commune and Bakuninist revolts. Ugo Parini and Pietro Vasai were among the founding members of the anarchist movement in Egypt. Luigi Galleani founded, in 1900, the Free University of Alexandria, distinguished for the fact that it did not discriminate against its students on the basis of gender, language, religion, or nationality. Along with the University, the Red Barrack was also among the gathering places of Alexandrian anarchists and intellectuals such as Giuseppe Ungaretti and Leda Rafanelli. The anarchist movement, as Paonessa points out, came to an end through a combination of circumstances, such as tightened control prior to the war by the British army, and the rise of Egyptian nationalism with its aversion to class radicalism. But the case of this anarchist movement constitutes evidence of the kind of ties that have long existed between the Italian intellectual community and Egypt. Drawing upon this memory, a different light is cast on the choice of many Italians students, academics, journalists, artists and teachers to emigrate to Egypt and their desire to be part of the uprising. A choice that ought not be seen as a simple escape from Europe but rather as a cosmopolitan investment - in the sense of being citizens of the world. …was an Italian citizen, a citizen of the world who could have helped many people in Egypt and the Middle East. He had foresight, that’s why he learned Arabic and was so interested in economics ... [and] marginalization … He did not go to war. He was not a journalist. He was not a spy. He was a contemporary young man of the future who was studying. He went for research, and he died under torture. Regeni's expertise in economics also embraced questions of liberty and inequality in Europe, as shown in this video. Regeni was arguing for the need to institutionalize common rights at a supranational level and for the creation of a federal system in Europe. Hence, Regeni’s engagement with the politics of the uprising, and with the work of independent trade unions in Egypt has to be seen as part of his non-national concern for economic justice and not, as has been argued, as a projection of neoliberal European grievances onto Egypt. The fact that Regeni’s emigration to the UK to study reactivated a latent debates over the Italian brain-drain – that is, the emigration of researchers to other countries – and motivated declarations by Prime Minister Matteo Renzi on the need to provide more funds to Italian academia, should not confuse the issue. What is this never-ending debate about contemporary Italy's brain-drain and the incapacity of the Italian state to provide employment for its graduate students, if not the actualized version of the inability of the Italian hegemonic class to absorb its own class of intellectuals? After Regeni’s body was found on February 3, the European Parliament issued a resolution condemning violence in Egypt. The Italian government called back its ambassador for consultation. However, both the EU and Italy, not to mention the US, are implicated in the violence in Egypt as they export weapons to the country. The pressure that is mounting from the Italian government is strategic for activists, media and academics, to make sure that issues of civil rights and academic freedom remain visible in international media. It has been argued that Italians are subjected to a particular benevolence in Egypt. If this is true, there are other factors opposing this assumption, implicit in what historian Alia Mosallam calls the rhetoric of post-colonial peoplehood. Such rhetoric was widely used by Egyptian intellectuals during the anti-British movement and during the Nasser era. In conclusion, the horrific death of Regeni marked the first incident, since 2011, and the only throughout the Arab revolts to my knowledge, in which a non-Egyptian was incorporated into the narrative of the revolution in the midst of the rise of a military-led, totalitarian, and ultra-nationalistic state. A woman in front of Cairo’s high court on 15 April 2016 carried a banner that read “Justice for [Giulio] Regeni, justice for the five [killed by the police], justice for all [the revolution’s] martyrs.” The mother of Khaled Saeed also expressed her solidarity with Regeni's mother in a video. Regeni’s death also marks the first time that European leftist activists have fully embraced the opportunity to consider political violence, in particular forced disappearances, in any country of this region other than Palestine. Meanwhile, a campaign to mobilize Italian publishing houses to send books to detainees in high security prisons called "pages against torture" has been taking place in several Italian cities. As a matter of fact, it took this event to make many of my relatives in Italy understand that the Egyptian President, Abdel Fattah El Sisi, was not the hero of anti-terrorism as depicted by Italian media. Although I had been trying to convince them otherwise since he took power. Regeni’s professional and political commitment was animated by an intellectual will to connect the struggle of labor unions in Egypt to the larger horizon of grassroots political movements in Europe. Practices of transcending borders theoretically and materially, of creating connections, and of nurturing social-cohesion are related to national political history and the sense of the state in a society, and therefore the elite’s capacity to subsume, to render organic, the groups of intellectuals that it generates. Numerous panels have been organized in Egypt and the US about the loss of academic freedom in Egypt, petitions have been signed by the Universities of Bologna and Turin, and more than a 1000 academics in the UK and abroad have expressed worry and indignation. Turin's Egyptian museum dedicated a gallery, the Hall of Deir el-Medina, as a memorial to Giulio Regeni. This event is, of course, also a reminder that ethnography, as a discipline to gain knowledge about the other, is itself entrenched in an asymmetric system of power which marked its foundation in the service of colonial power. 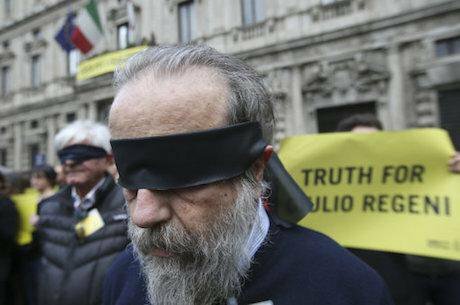 In the death of Giulio Regeni and Syria’s thousands of Regenis, none of us can be considered innocent. A previous draft of this article was presented at the 2016 AT Gender conference "Spaces of Feminist learning and teaching".